Learn to do magic from one of India's most thrilling performers.Magic is about the ability to convince. It is about performance. You don't fool your audience, you amaze and entertain them. Nakul Shenoy, mind reader and internationally successful magician, can teach you how.Smart Course in Magic is a simple and effective off-the-shelf course that teaches the craft as it should be: focusing on the theory of performance and presentation. Whether you want to take up magic as a hobby or improve your skills as a professional performer, this is the book to set you on your way. 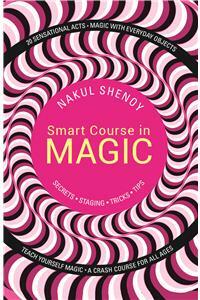 NAKUL SHENOY is the Mind Reader - an expert magician and hypnotist based in Bangalore, India. A speaker and entertainer on topics of communication and people behaviour, he travels the world addressing elite audiences drawn from top corporates.Having taken to magic at the age of five, via his fascination for the comic book series 'Mandrake the Magician', Nakul performed his first public show at the age of fifteen. Twenty years on, he continues on his self-professed journey to be 'a real-life Mandrake'. A compulsive reader 'on every topic under the sun and beyond', he haunts Twitter as @nakulshenoy. You can also connect with him at www.nakulshenoy.com.